My eye! Here's a lady bicyclist! Look at her! Look at her! Look at her! Look at her! And thinks they won't be missed. 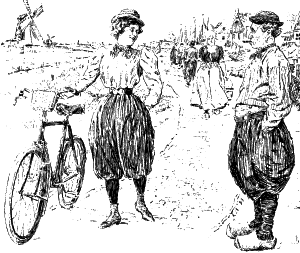 Lady Cyclist (touring in North Holland). "WHAT A RIDICULOUS COSTUME!"